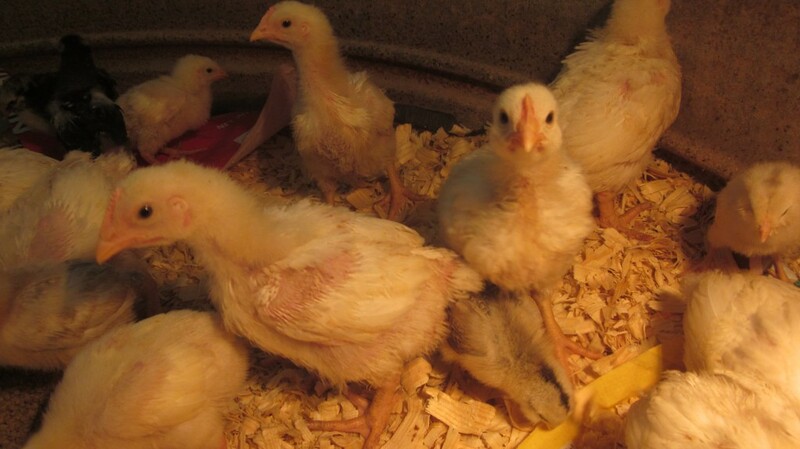 The Cornish cross chickens are no longer cute. 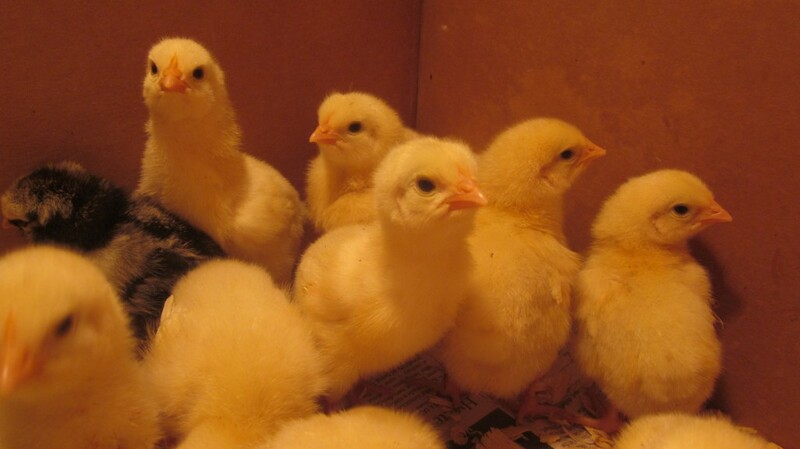 Remember how we started out with them about a month ago and they were soft and velvety and so adorable . . . They spent their first couple of weeks in a big box in the basement, and I wrote about that right here. Quickly enough the box wasn’t big enough. I added two “spare rooms.” Wasn’t big enough again. 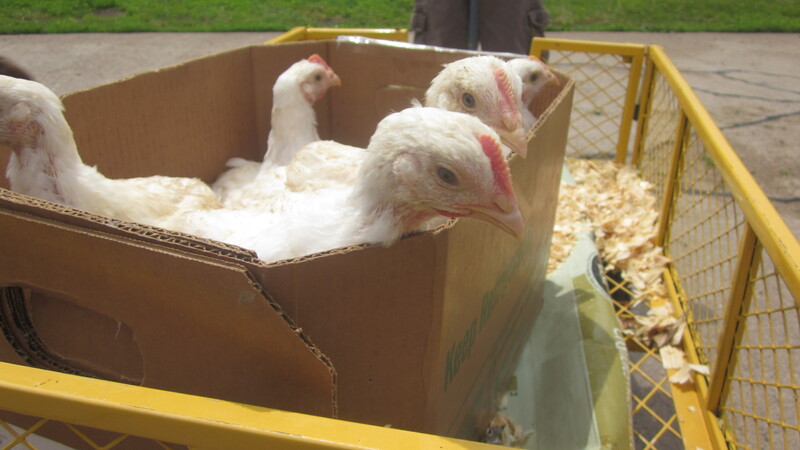 These chickens grow so fast that within two weeks they had outgrown their box (even with the two added spare rooms) and we moved them into a stock tank in the garage. I wrote about that, too, and you can read about it here. Two weeks ago, these chicks looked so small in that big stock tank. But they outgrew it quickly, too, and little Mack and I moved them out to their fresh-air gazebo yesterday. It was quite an undertaking. You’ll notice that I am not publishing a “before” picture, as the stock tank was . . . very full of large chicks and their byproducts, shall we just leave it at that? Our operation was thus: Little Mack stood ready with a wagon, which had a sturdy box inside. 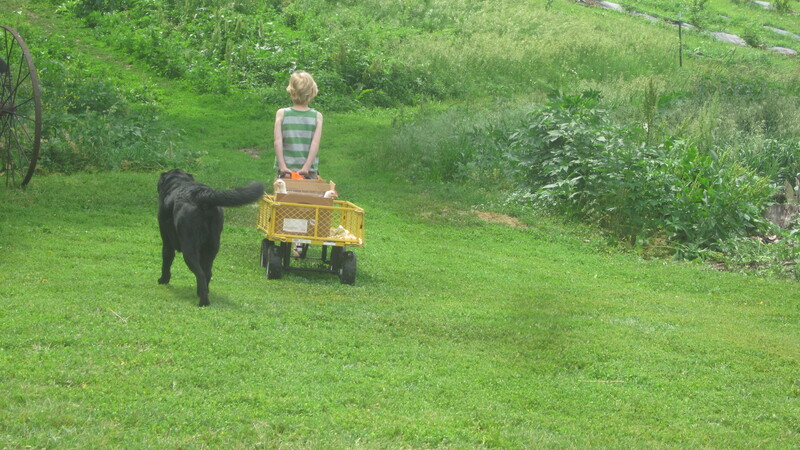 I’d pick up the chickens one by one and load them into the box, and then little Mack would pull the wagon across the yard to the open-air gazebo that we had prepared with food and water and anti-dreaded-varmint fortifications. I’d trudge along behind him, carrying feed and water buckets and so on. 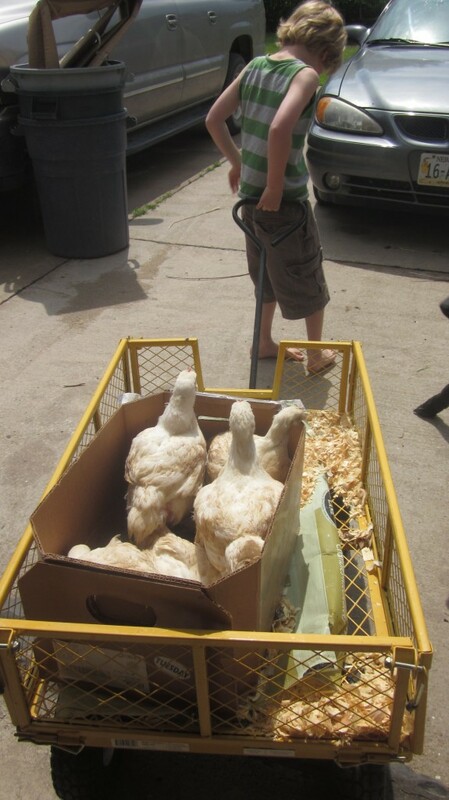 Then I would lift the chickens into their new digs, one by one. The dogs just thought we were participating in some sort of fun, mad-cap parade, or perhaps merely taking the big chickens out for a walk in the sunshine. They’d never had so much fun, following us to and fro, Bea now and again snapping at the chickens, Ollie doing his nudge-nudge-pet-me-now thing. Bea was just daring them to try to escape. They, of course, had no interest in escape. No interest in much of anything, really, bless them. 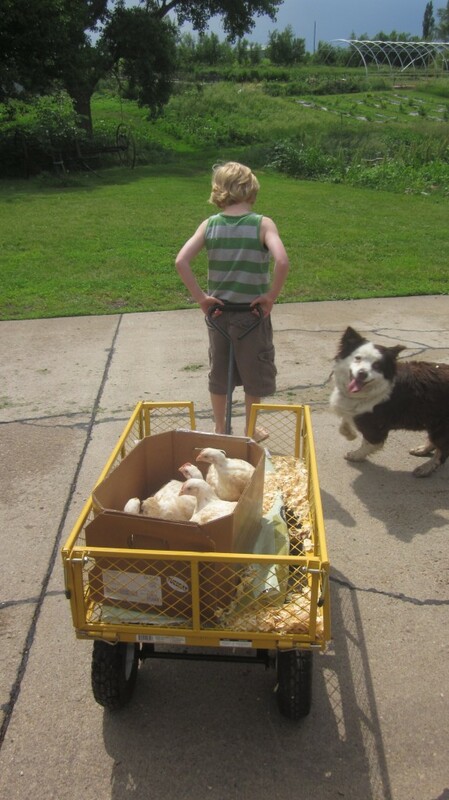 Our Australian Shepherd Bea was excited and was convinced that we needed her help to keep the chicks inside the box. 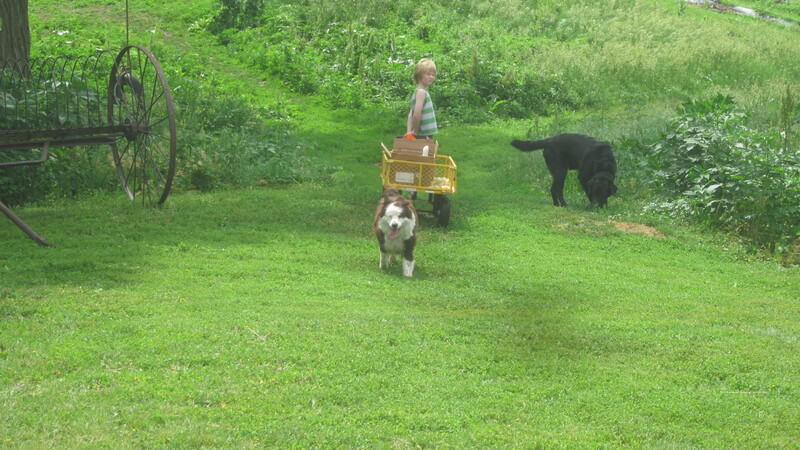 Where the little man and the chickens go, faithful Ollie goes, tail a-wagging.
. . . and Bea . . .
. . . or maybe not . . .
Bryan and Timothy made this dandy open-air gazebo for my Cornish chickens many years ago, out of PVC and chicken wire. It has served us well. I’d dearly love to add on to our tiny chicken coop, but until that day this temporary yard has worked well for the few weeks when the Cornish are growing so fast. 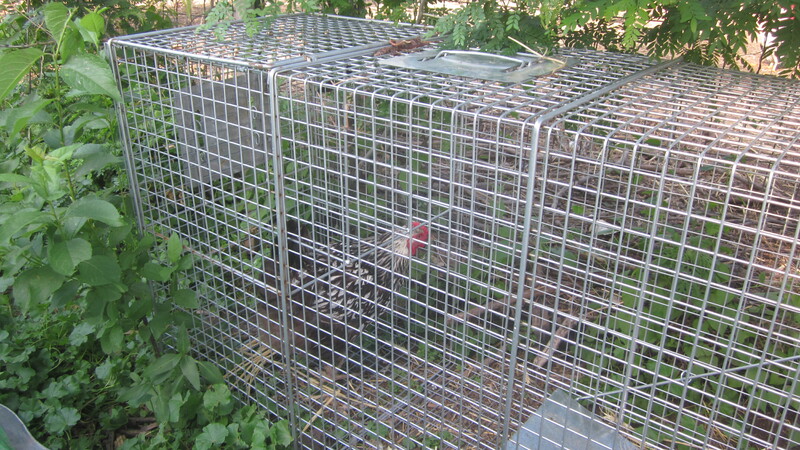 We’ve put many anti-varmint measures in place, including a bated live-trap very close by. Chickens often get trapped inside, but at least then we know that we’ve got it triggered correctly. It’s a little tricky. After a week or two, we’ll pull up the posts that are securing this structure to the ground, and move it to a new, fresh spot. The chicks get a bit of fresh foraging this way, and they get a new view from time to time. New views from time to time do wonders for the spirits, do they not? Our move of the chicks was a success, and the “byproducts” (for you squeamish ones) I loaded out to my compost pile and my newly-planted melon hills, in a very large wheelbarrow. This is Little Red. 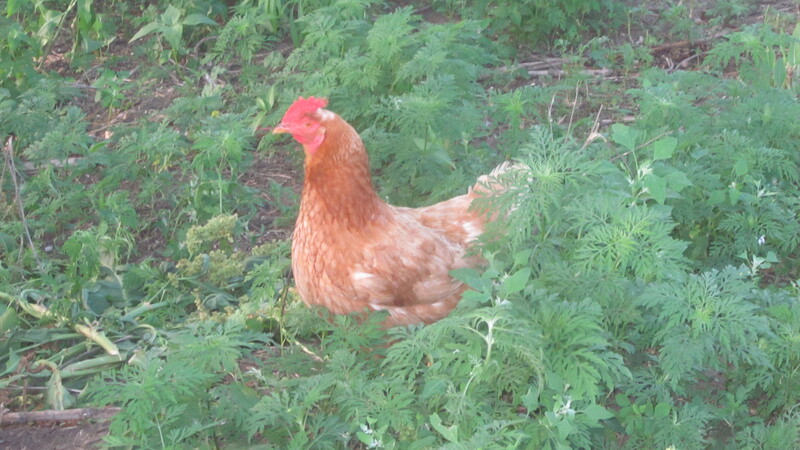 She is happy that she is a named hen, and therefore a permanent member of the family flock. ← Make the Only Tomato Cages You’ll Ever Need, in Minutes! 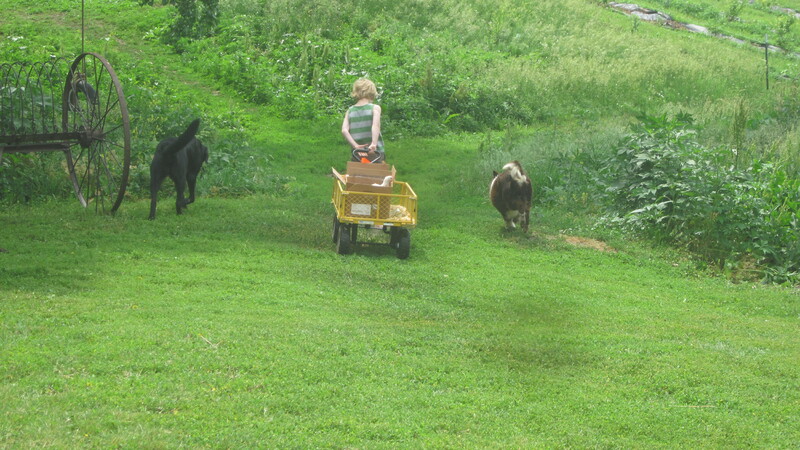 So, time for a little chicken tractoring, and soon enough, some good eating. We never grew the Cornish crosses, back when we had chickens (30 plus years ago) but did raise a White Laced Red Cornish. White laced Red Cornish sounds intriguing! I’ll have to look that up for next year! Ffingers crossed that the anti-DV traps continue to protect the Cornish! Love the dialogue between the chicks and the dogs are cute! A breath of fresh air for all concerned. Your son looks so sweet pulling the chicken cart. It’s a good thing chickens don’t worry unduly about the future. Just imagine if humans were inside and a chicken was pulling. Haha. So cute! I loved the little dialogue you had between them!!! I had to read it to my hubby and we both LOL! Glad you got them all moved. I love the way the dogs have to be involved! This way I get to pretend I am involved with chickens with out having to deal with the smell or “byproducts”! As a matter of fact, Arla, those “Cornish Game Hens” are simply the same Cornish chickens, but they are butchered when they are just a few weeks old. Sort of like chicken veal. Thanks for your sweet comment! I just love the care and how thoroughly you do everything. Very inspiring. Needed that little push this morning! Oh my how they’ve grown, they are looking amazing and as ever I dream of chickens and goats *sighs* one day. Thanks for another wonderful insight into life with you and yours, just love it. Thank you Anita-Clare. Hope someday your chicken and goat dreams will materialize! 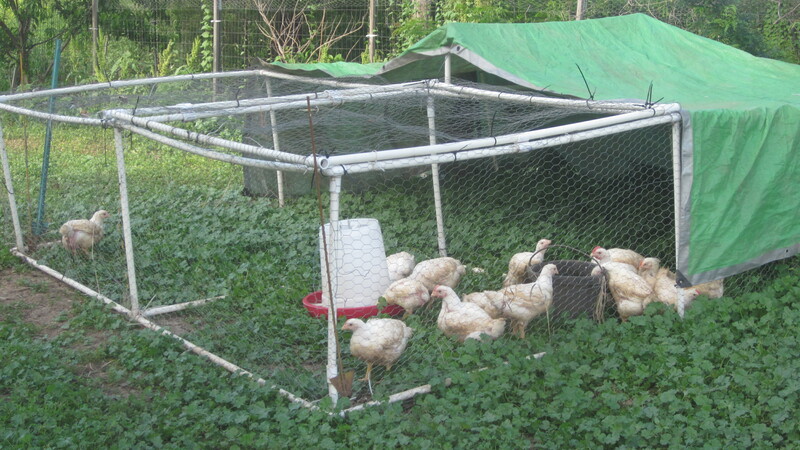 Check out the chicken tractor I designed and constructed at http://www.raisingbackyardchickens101.com/chicken-tractor-plans.html My tractor is light enough to move, but heavy enough to keep predators from lifting it. And the metal part locks up secure at night so even a weasel could not get in. 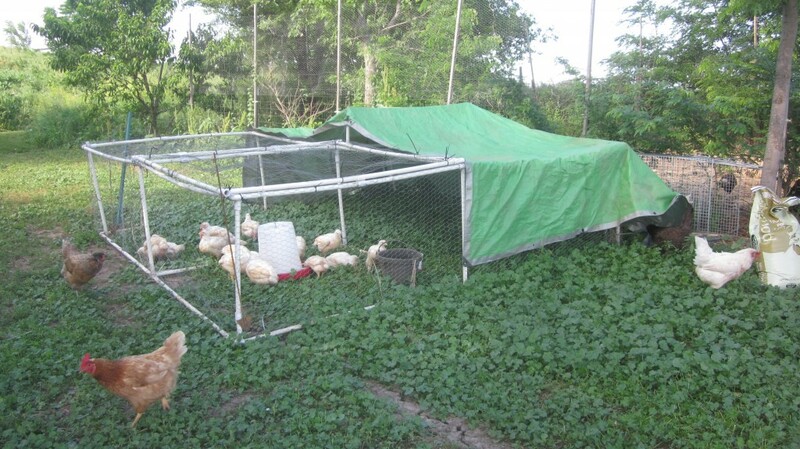 I move it each day so the chickens always have a fresh area. Love your posts! You mentioned adding the “by-products” to your newly planted melon hills. Don’t you have to wait 6 mths to put on garden? Terri, I probably go my own way on this, contrary to what you’ll read other places. Melons take months to mature and ripen, so I do add chicken “by-products” to the hills, working them into the soil (not just lying them on top!) to fertilize. I would never do this with a crop like radishes (which can mature in as little as 3 weeks!) or lettuce (also very quick) because of food safety, natch’! Heck–if I have to wait 6 months to put it on my garden, I might just forget where I put it! (honestly) This method has always worked very well for me. Ok. Thanks. Just learning all this stuff. I’ve gardened before but am no expert. 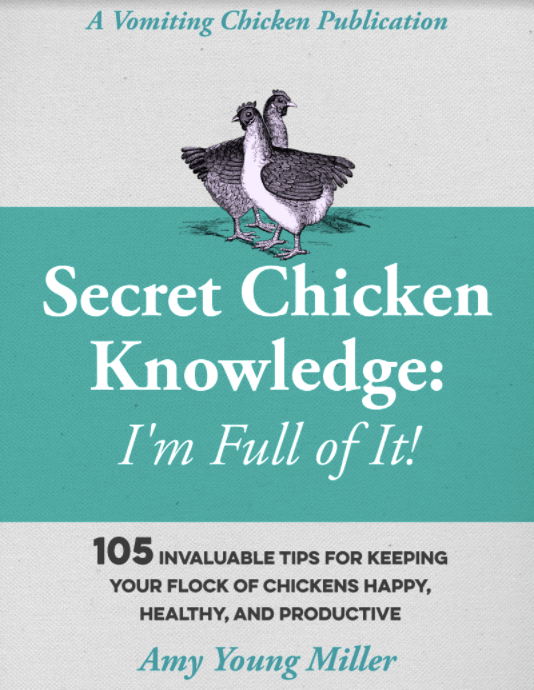 Do you recommend waiting until spring to start with chickens or can I start anytime? I’m in Ohio. 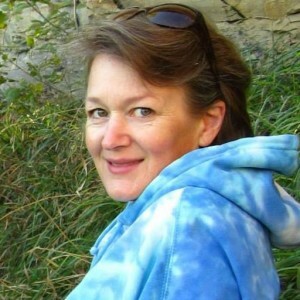 Terri, best-case scenario: I’d wait until spring! Easier on you and easier on the baby chicks!